Today we look at a mysterious case of legal levitation from South Africa. LAW BOOKS LEVITATED IN OPEN COURT. A mysterious occurrence disturbed the legal decorum of the Civil Court one morning last week, and since then has been the chief topic in the mouths of those who witnessed it. The story they tell is a marvellous one, and yet the men who tell it have a reputation for veracity. It appears that the Civil Court had just assembled. The A.R.M. Mr. de Wet had taken his seat upon the bench in the small court. The court messenger, Mr. Buckley, standing in front of the bench, was reading the list of cases. Mr. D. M. Brown, M.L.A., was sitting at the ‘horseshoe.’ On the corner of the ‘horseshoe’ two folios of law reports, bulky tomes weighing several pounds each, stood, one on the top of the other. The court messenger, Mr. Brown, and the books were the principal actors in the drama. Their respective positions formed what was practically an isosceles triangle. The books were at the apex, Mr. Brown and Mr. Buckley at either angle of the base. Whether Mr. Buckley or Mr. Brown saw it first, or whether they saw it simultaneously, is unknown. But both of them affirm that on a sudden, while they remained the nearest human agents, yet not near enough to touch them, the books rose in the air. They rose in the air, remained poised moveless for an appreciable space of time, and sank to the table again. Three times this happened in the space of something between two and five minutes. Mr. Brown says that the books rose sufficiently high to allow him to see the space between them and the table; and he distinctly affirms that between the bottom cover of the lower book and the table there was nothing but thin air. The stories of Mr. Brown and Mr. Buckley agree except for the calculation of the height to which the books rose and the space of time which the phenomenon occupied. In seeking to find an explanation for what on the face of it is an extraordinary affair one or two points must be kept in mind. The witnesses are emphatic that no human being was near the books. It happened in the prosaic light of morning, not at midnight. The witnesses observed it from different angles and from different altitudes, one being seated and the other on his feet. These facts appear to rule out of court any possibility of explaining away the matter by labelling it an.hallucination or an optical delusion. Neither of the gentlemen who saw the books rise is able to offer any explanation of their rising. They saw the books rise at least three inches from the table, and remain several seconds unsupported in the air before they sank to the table again. They saw this happen three times. They are positive they saw it. Neither of them is a Spiritualist. Neither of them has been able to formulate any theory in the matter. It is a mystery. During a preliminary examination of a civil matter, Mr. de Wet, Assistant Resident Magistrate; Mr. D. M. Brown Member of the Legislative Assembly and Law Agent; Mr. Reginald Theophilus, Law Agent ; and Mr. Buckley, sen., Messenger of the Court, being present, Mr. de Wet, A.R.M., being in the magistrate’s chair (as shown in the accompanying diagram); Mr. Buckley, sen., standing near the A.R.M. 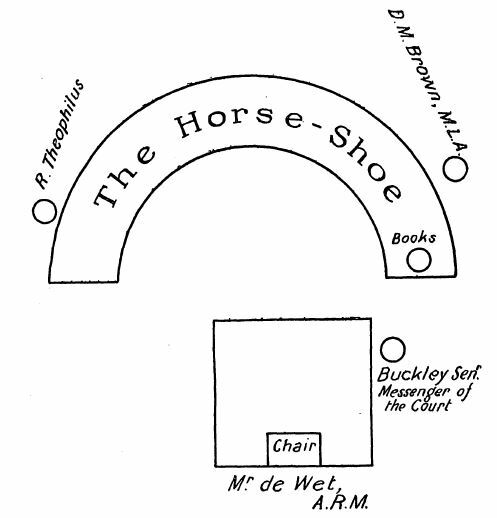 ; Mr. Brown and Mr. Theophilus being at the ‘horseshoe,’ but at opposite sides thereof, Mr. D. M. Brown, M.L.A., and Mr. Buckley, sen.; distinctly saw two large volumes (ledgers), placed at one extremity of the ‘horseshoe,’ and between Mr. Brown and Mr. Buckley, sen., raised three times several inches from the table (horseshoe) and replaced thereon without visible contact. I was informed of the above fact by Mr. Buckley, sen., in presence of Mr. A. Hansen, detective, who is a Spiritualist, and from whom I first received notice of the occurrence. It was on Friday morning that I was informed of the circumstances by Mr. Buckley, whom I questioned carefully, and who had previously, at Mr. Hansen’s request, taken him into the court and enabled him to draw out a diagram, the copy of which I enclose herewith. While speaking to Mr. Hansen and Mr. Buckley on the occasion I have just mentioned as having taken place on November 1st, I saw Mr. D. M. Brown, M.L.A., passing and asked him for confirmation of what I had just heard. He replied, ‘Ask Mr. Buckley for a written account of the matter. I have no objection to his giving yon one.’ I then asked Mr. Hansen to get a written statement accordingly. To-day, the date of my writing, is November 3rd. I have not seen Mr. Hansen since, but as to-morrow is mail-day I am anxious to lose no time in sending this to you. On the same Friday, November 1st, Mr. Fitzsimmons, director of the P. C. Museum, who is himself interested in psychic phenomena, told me that he had been informed of the above-mentioned occurrence, exactly as narrated here by me, by Mr. Brown at lunch in the Market Cafe on the previous day, and in presence of other gentlemen, to whom Mr. Brown also stated the same facts. The Tuesday (October 29th) on which the phenomenon occurred was the day for the funeral of Mr. R. H. H. Stockdale, a gentleman employed in Mr. D. M. Brown’s office. Mr. Stockdale had no doubt been working with the books levitated, and was interested in the case before the court. When the levitation took place Mr. Brown evidently thought that Mr. Stockdale was connected therewith, for he at once mentioned his name, though afterwards he stated that he thought the phenomenon was intended for Mr. Buckley, and that it probably indicated the decease of some relative of his. Port Elizabeth, Cape, South Africa. Local Spiritualists claim to have discovered an ‘explanation.’ Mr. Brown, when he is not attending to the affairs of the country in the House of Assembly, practises as a law agent, and it was in this capacity that he attended the civil court to-day. A few days ago Mr. Brown’s chief clerk succumbed suddenly to ptomaine poisoning. The dead man had all the facts of the case in which Mr. Brown was appearing at his finger ends, and the Spiritualists say that his astral body, or whatever it is they call it, appeared in court and lifted the books from the table in order to draw his chief’s attention to some reference in them bearing on the case. Meanwhile Mr. Brown is being subjected to a deal of good-natured banter by the sceptics. I believe that the author of the letter, Henry Glasse, was an anarchist and leader of labor movements in South Africa. I suppose he might have made up the story, possibly to discredit someone in court? Or was it a neat piece of conjuring, motive unknown? (Although how it was worked, I haven’t an earthly.) I like the idea of a harried law clerk making one final appearance in court before he is called before the Final Bar.